Raw Milk Cheese Appreciation Day kicks off our grazing season every April, and it looks like mother nature is cooperating… the grass is greening! 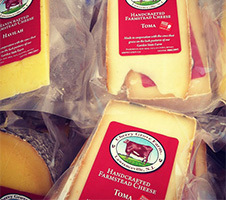 Meet the Makers tents featuring great local chutneys, butters, jams and marmalades that complement our raw milk cheese. Visit with Naomi from Le Bon Magot, and Gino from Eat This Yum the weekend of the 13th, and Barbara from Muirhead Foods, and Naomi from Le Bon Magot, the 20th. 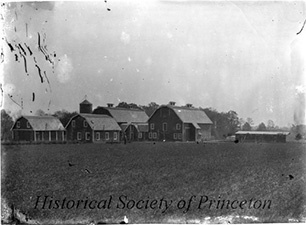 Free Public Farm Tours – about an hour long pasture walk into the back forty at 11:30 and 3pm. 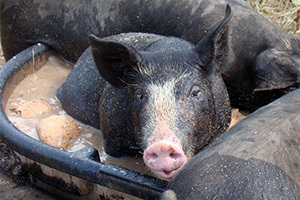 Free Hayrides – Hayrides take you back to the pond, if the ground permits. Too wet and we cannot pass. Rides will run about 20 minutes long, from noon until 4pm. If you are on farm at 4pm you might as well hang out and watch milking and calf feeding! 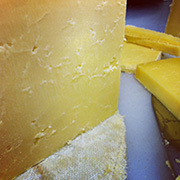 On Saturday, April 13th at 2pm we will offer a free class “Building Your Best Cheeseboard”. The session will be between 30-40 minutes long and get into some pairings tips as well. This will be first come first serve with a max of 20 people. 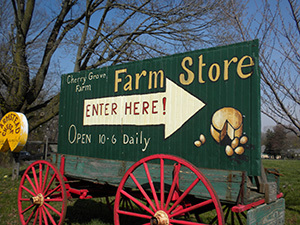 A sign up sheet will be in the farm store that morning. 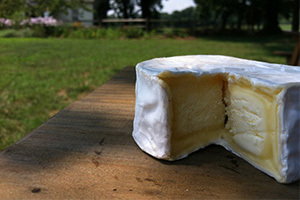 Why celebrate raw milk cheese? Well, number one, its delicious. And a healthy form of protein. But also, to raise awareness about this superior artisan product is being made right here in New Jersey. 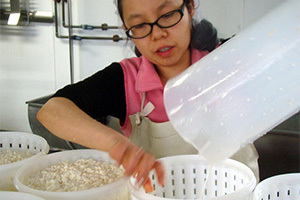 Raw milk cheeses have a richer, more complex flavor than their pasteurized brethren because of the increased microbial diversity. Once you heat treat milk, you lose the good microbes along with the bad. 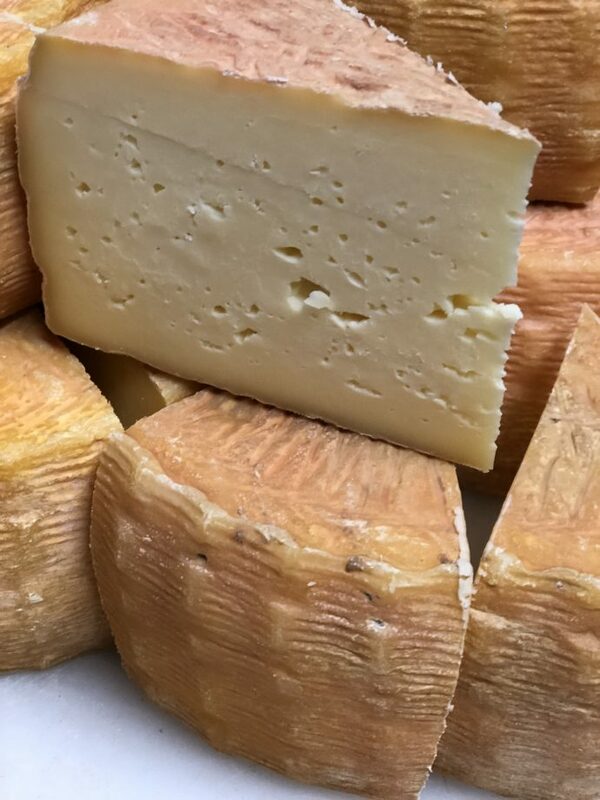 Our cheesemakers will tell you that raw milk cheeses ripen faster, develop more intense flavors, and have more “nose” than pasteurized milk cheeses. And we also like the idea of tradition. Before pasteurization, all milk—and thus, traditional cheese—was raw, so raw milk cheeses keep with the old ways. 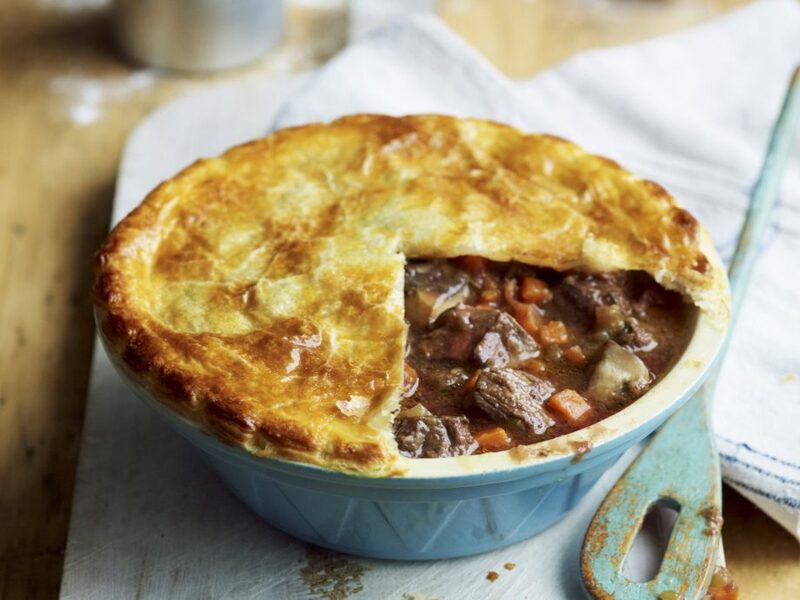 A glorious cold weather treat, steak and kidney pie is pretty simple and easy to make ahead. Heat a large frying pan with a little of the dripping or oil. Season the diced beef with salt and pepper. Fry in the pan until well colored and completely seared. Lift the meat out and transfer to a large saucepan. Add a touch more oil, if necessary, to the frying pan. Season the kidneys, frying quickly to sear and color in the hot pan. Also transfer to the saucepan. Melt a knob of butter in the pan and cook the onions and carrots in the melted butter for 2 – 3 minutes. They will lift any flavors left from the meats. Put the vedge into the saucepan with the meat. Saute the mushroom slices in a little more butter which will become part of your roux), just turning in the pan for a minute or two; keep to one side. Place the saucepan on medium heat, stirring in the flour, and allow it to cook for 2 to 3 minutes. Add the tomato puree, bay leaf and mushrooms. Pour in the stock and bring to a simmer. The meat should just be covered with the stock; if not, top with a little more stock or water. Simmer gently, partially covered, for 1 1/2 to 2 hours. During the cooking time it may need to be skimmed several times. After 1 1/2 hours, check the meat for tenderness. If not quite soft enough, cook for the additional 30 minutes. If the meat is cooking gently, it will not need to be topped up with any additional stock or water. The sauce will have reduced, thickening its consistency and increasing its flavor. Taste for seasoning, adding a dash or two of Worcestershire Sauce to the mixture. Transfer to a 2 pint pie dish and cool to lukewarm. Roll the pastry 1/4-inch thick. Cut a strip of pastry to sit around the rim of the dish. This will help the top to stay on. Brush the rim of the pie dish with some beaten egg and apply the strip. Brush again with egg. Making sure the pastry top is bigger than the dish, sit it on top. Push down around the sides, trim and crimp for a neat finish. Brush completely with egg wash and place in the preheated oven. Bake for 30 to 40 minutes until golden brown. “This is Gary Rhodes recipe for a great steak and kidney pie, which also allows you the bonus of making the filling the day before you need. March Comes in Like a Lion…and Leaves Like a Calf. Late March and into April is calving season on the farm; time when we have lots of babies in the nursery barn. We always get a lot of questions at this time of year, so it is worth revisiting why we farm the way we do. You may have seen, or at least heard of, inhumane veal-raising techniques. 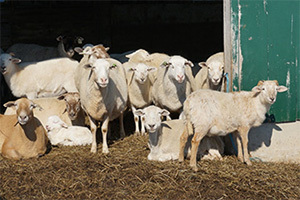 The image people usually recall when they swear off veal, are rows and rows of small white pens housing increasingly large calves. So when you, our friends, visit our nursery barn, don’t mistake our calf pens for veal pens, because you are actually looking at young dairy heifers! The young ladies in our nursery are milk cows in the making, and will stay in their pens for about three months while they are still drinking milk every day. Once they are big enough, they will join their older peers in the larger calf paddock. Visitors have asked why we do not allow the calves to stay with their mothers during their early months, and there are several answers to that question. First, with the youngest calves close by in individual pens, it is much easier to monitor their health, wellness, and growth. When calves are scampering through the fields in a large herd, they are much more prone to illness, injury, and even getting lost (the adventurous babies like to wander)! 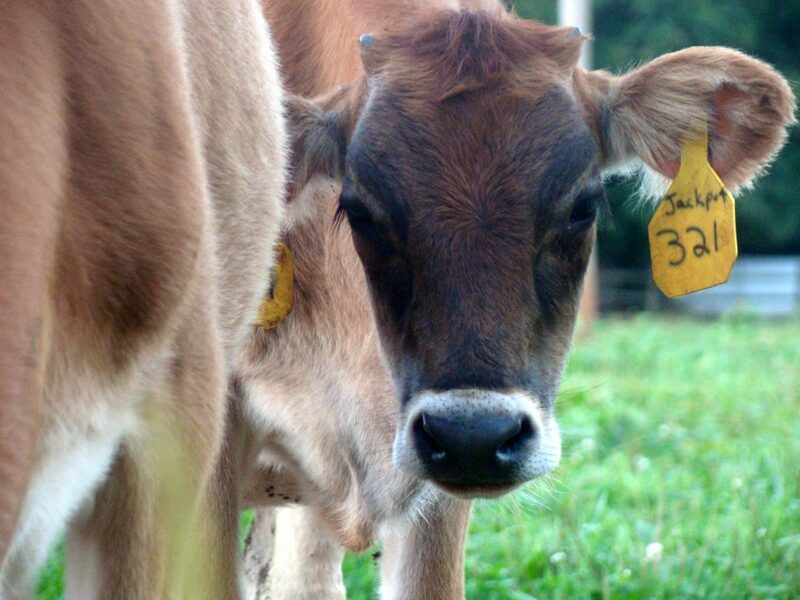 By keeping a close eye on them, we can thoroughly assess each calf every day. 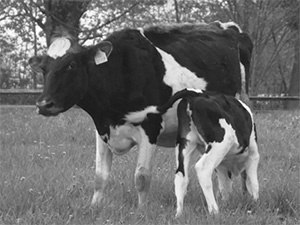 Second, it is better for the emotional welfare of both cow and calf to separate them immediately after delivery. Whether right off the bat, or after weeks of direct nursing, there will ultimately come a day when the babies must leave their mothers. The separation process is much less stressful if taken care of right away, because the longer cow and calf are together, the more they will bond, and a strong emotional bond makes for a very stressful separation. We prefer for our animals to be both healthy and happy, so we limit this stress by doing a post-partum separation. 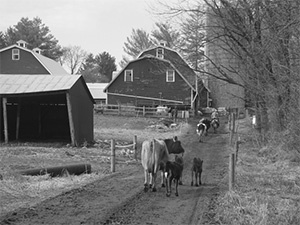 The proof is in the peace and quiet of our barns at calving time… no bellowing or lowing across pastures, no stress. Third, bottle-feeding allows us to monitor the calves’ daily milk intake. Calves can be greedy and will drink so much milk that their mothers make themselves sick trying to keep up with the baby’s demands. And in the field, other calves will try and nurse from cows other than their mothers, which can cause the problem of not enough milk going to a more reticent baby. Like all babies, calves need a certain amount of milk to thrive and grow. 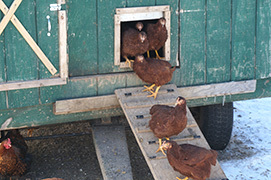 In the field, we cannot make sure everyone is getting enough food. In the nursery, we are able to ensure that each calf is getting enough milk to grow up healthy and strong, without putting too much stress on their mothers. And lastly, calves can and will go feral if not in regular contact with people. By handling and socializing with the young stock on a daily basis, we are conditioning them to be comfortable and friendly around people. This will make things much easier, and safer, when we introduce them to the milking parlor in a couple of years. So when calving starts next month, come visit our nursery and get to know our youngest family members! Find out which will give you kisses all day long, or who loves scratches under her chin. Our farmers know their calves. When you spend as much time with them as we do, you have to. Preheat oven to 350° F. In large bowl, combine all meatball ingredients except oil. The key to good meatballs is not to over mix them. Just gently combine the ingredients until everything is evenly distributed. Form the mixture into golf-ball sized meatballs. Heat oil in large skillet over medium-high heat. In batches (don’t crowd the pan! ), brown the meatballs on all sides. Transfer meatballs to rimmed baking pan and transfer to oven. Bake 10 minutes or until internal temperature reaches 160° F.
Meanwhile, in small saucepot, combine all glaze ingredients. Cook over medium heat 5 minutes or until mixture is slightly thickened. 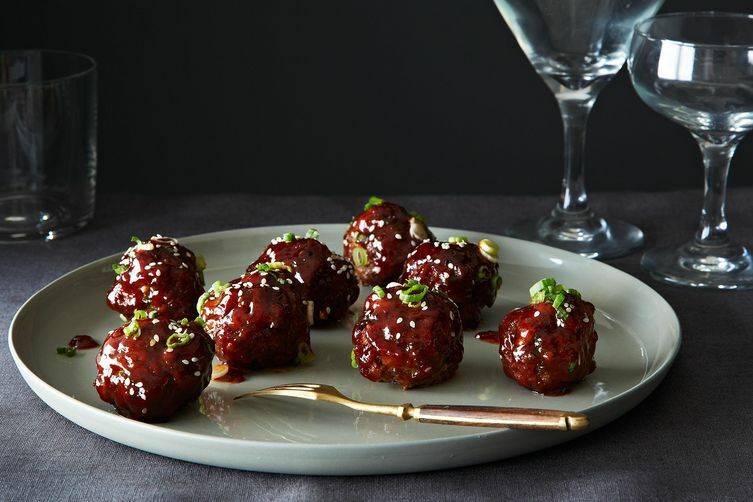 To serve, brush meatballs with glaze and sprinkle with green onion and sesame seeds. What’s going to be on your Super Bowl Party table? 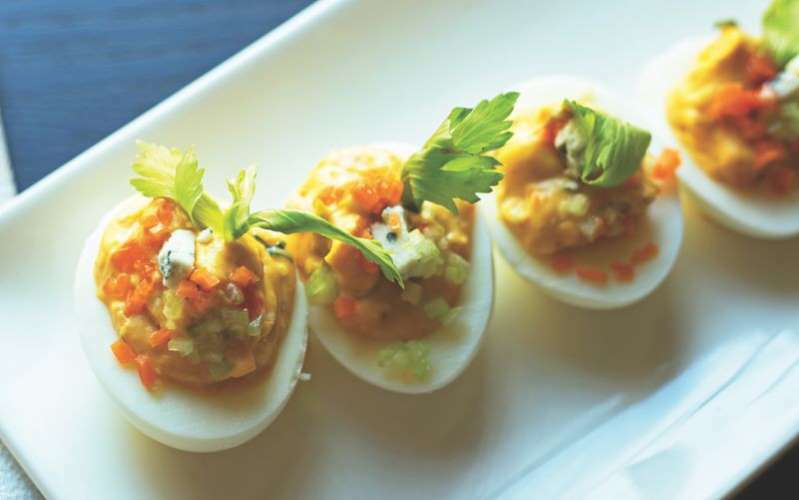 We thought these buffalo deviled eggs sounded delicious. Bring a large pan of water to a boil over high heat. Cautiously lower eggs into water with a slotted spoon, then lower heat to maintain a gentle boil for 10 minutes. Remove eggs to an ice bath and cool until barely warm (2 to 3 minutes). Peel eggs fat-end first, rinse, and slice in half lengthwise. Carefully remove the yolks to a bowl without breaking the whites. Choose the twelve nicest looking egg-white halves. In a bowl, combine yolks, mayo, sour cream, 1/4 cup hot sauce, lemon juice, 2 tablespoons blue cheese, celery salt, pepper, mustard, parsley, and half the cayenne. Mash yolks and mix thoroughly until smooth and evenly combined. Stir in minced celery, and carrots. Collect mixture to one corner of a large sealable plastic bag. Cut off the tip of the corner and pipe mixture into hard-​boiled egg whites. Garnish each Buffalo deviled egg with remaining cayenne and blue cheese, and top each with a celery leaf, a few drops of hot sauce, and (for the heat-seekers) a thin slice of serrano. Reposted from The Buffalo New York Cookbook. Copyright © 2018 by Arthur Bovino. Photograph copyright © 2018 by Arthur Bovino. Published by Countryman Press, a division of W. W. Norton & Company.